This one has been a long time in the making. Do y'all remember way back when I first showed off plans for our nursery? Back in January? Well, way back then I had already decided to paint this and had already designed it -- it just took five months for me to do anything else about it. 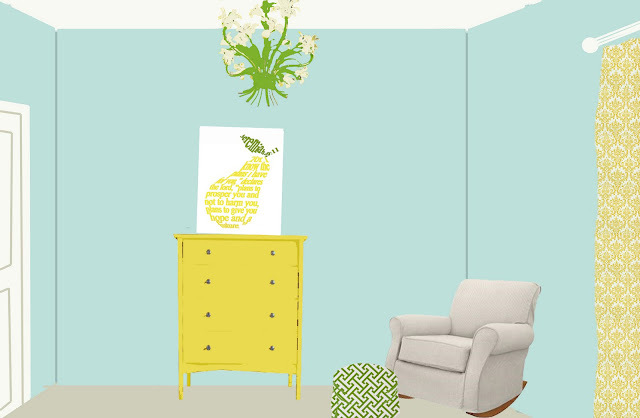 Here it is in my badly Photoshopped version of our nursery that debuted back in January. 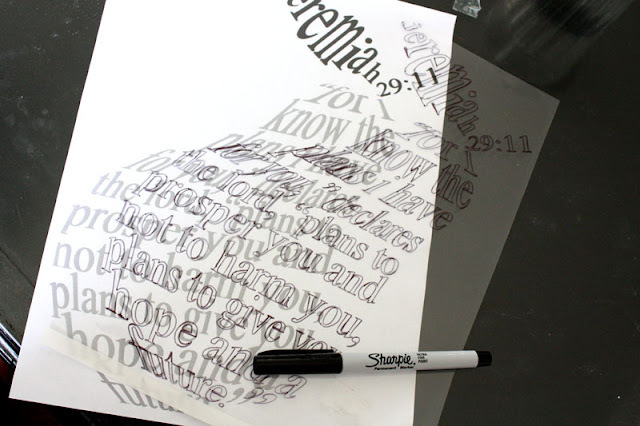 But shortly after getting my hands on an overhead projector (I definitely was not going to free-hand this one!) I got to work. It probably took me about eight hours total from printing the design to the last bit of paint. Here's a quick run-down of the whole process. *Find an outline of the shape you want to use and open it with Photoshop. *Decide on your text and which words will fit on each line. Lay out the lines of text. *Add guide lines over the shape to section it into however many segments you need. *In a new layer, type out your first line of text. Make the text box as small and tight around the words as possible. Select the 'move' tool (the arrow). *Go to Edit > Transform > Skew. Use the Skew tool to drag the outer corners of the box around the words so that the shape of the words fits the shape underneath it. *Repeat until all the text is filled in and fits the shape. *Hide the bottom layer that has the shape outline. *Print it directly onto a transparency, or if you don't have the right kind of transparency for your printer, print on a piece of paper and trace the design onto a transparency. *Using an overhead, (Check craigslist and yard sales -- mine was $5! You can also rent projectors.) trace the design onto your canvas using pencil. *Get rid of any stray pencil marks using a kneaded eraser. It's really not that difficult to do if you know your way around Photoshop. And if you don't, check out gimp. I'm pretty sure you can do just about anything with it, and it's free! P.S. For anyone who's curious, the whole project cost $12.50. I had transparencies already, and the paint was left over from another project. The canvas should have been $25, but it was 50% off at Hobby Lobby. BEAUTIFUL!!! I love this! You're so stinkin' talented! WOW! that looks amazing and i love the scripture. simply beautiful. I don't own photoshop, but if I did, I think I could literally spend hours making these. Love your finished product. Wow, I love this! Thanks SO much for sharing this, I can't wake to make my own. I'll be linking. This looks so good! I really need to spend some time leaning photoshop. I am so impressed! 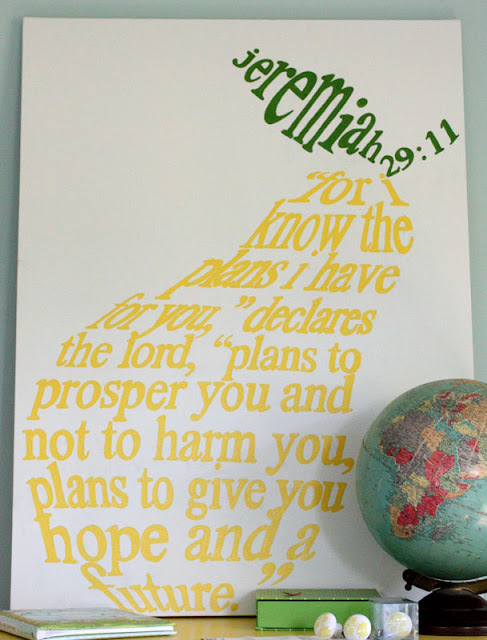 I love the colors, design, and the verse! Great job! Awesome Britt! Both you and Brooke are so so talented! This could be another thing to add to your shops. Just stopping by from One Pretty Thing. Amazing! I love it! Wow, that's amazing. I love that. So creative, and I love that verse. Fantastic idea! And how original to use a Bible verse too. I might try out a project like this when I get some child-free hours to paint, LOL! Wow ~ so creative! I love this idea and can't wait to give it a try. ThanX so much for generously sharing instructions. 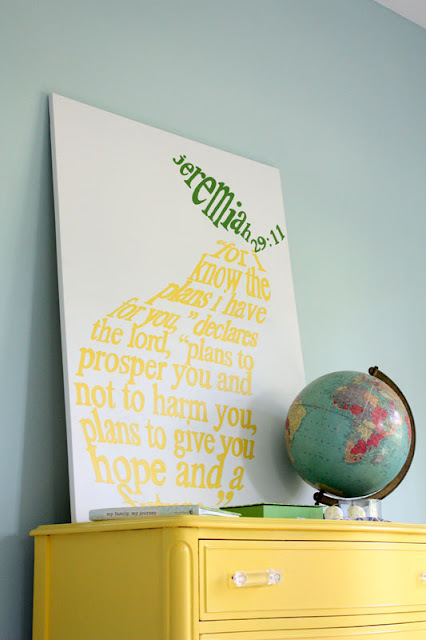 You know I love scripture art! That looks GREAT! WHERE did you get that dresser??? I absolutely love it. Amanda, Thanks! I got it at a yard sale several years ago and painted it yellow and changed the hardware for the nursery. This is so stinkin' cute! Love it! Thanks for sharing! 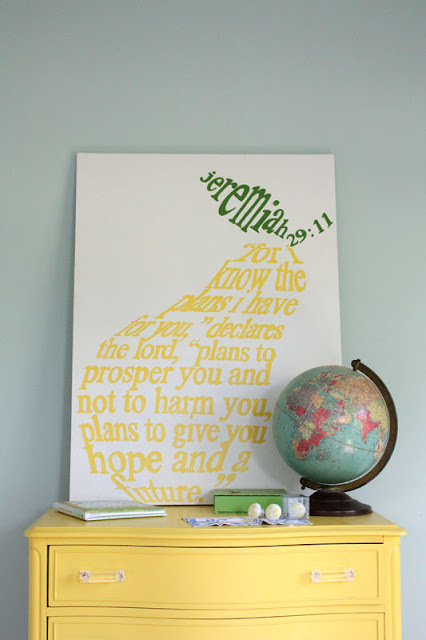 Wow--this is so beautiful--I love the artwork, but also the color of the wall, the yellow dresser, and the globe! It all looks so stunning together. Shared it on the blog today! Everyone loves it! I love this! You should open an etsy shop selling these. Awesome! this is sooo cute!! 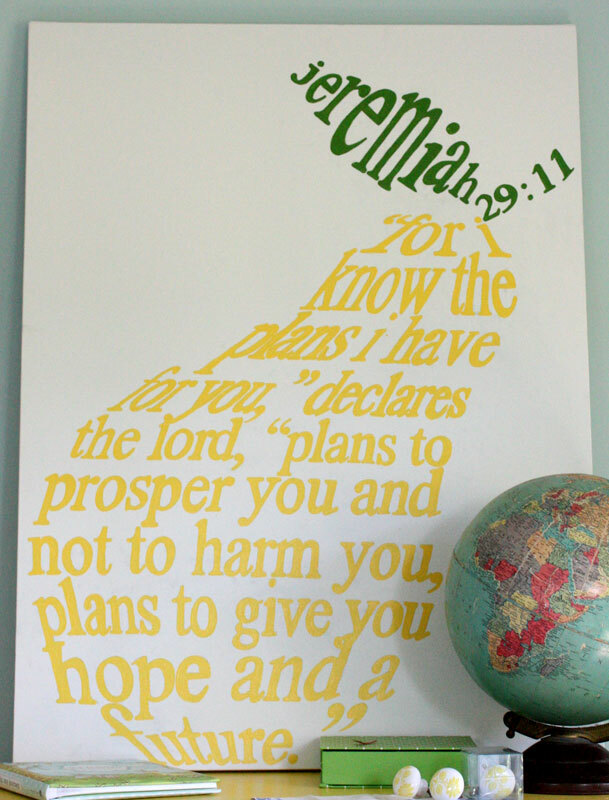 One of my fav verses. Absolutely A M A Z I N G!!!!! !